The Office of Management and Budget (OMB) is the largest office within the Executive Office of the President of the United States (EOP). OMB's most prominent function is to produce the President's Budget,  but OMB also measures the quality of agency programs, policies, and procedures to see if they comply with the president's policies and coordinates inter-agency policy initiatives. The current OMB Director is Shaun Donovan, who was nominated by the president following the nomination of Sylvia Mathews Burwell to become the United States Secretary of Health and Human Services. Donovan was confirmed by the Senate in a 75–22 vote. The OMB Director reports to the President, Vice President and the White House Chief of Staff. 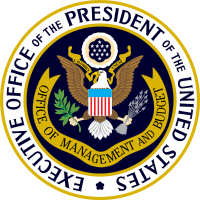 The largest component of the Office of Management and Budget are the four Resource Management Offices which are organized along functional lines mirroring the U.S. federal government, each led by an OMB associate director. Approximately half of all OMB staff are assigned to these offices, the majority of whom are designated as program examiners. Program examiners can be assigned to monitor one or more federal agencies or may be deployed by a topical area, such as monitoring issues relating to U.S. Navy warships. These staff have dual responsibility for both management and budgetary issues, as well as responsibility for giving expert advice on all aspects relating to their programs. Each year they review federal agency budget requests and help decide what resource requests will be sent to Congress as part of the president's budget. They perform in-depth program evaluations using the Program Assessment Rating Tool, review proposed regulations, agency testimony, analyze pending legislation, and oversee the aspects of the president's management agenda including agency management scorecards. They are often called upon to provide analysis information to any EOP staff member. They also provide important information to those assigned to the statutory offices within OMB, which are Office of Information and Regulatory Affairs, the Office of Federal Procurement Policy, the Office of Federal Financial Management, and the Office of E-Government & Information Technology whose job it is to specialize in issues such as federal regulations or procurement policy and law. ↑ Kim, Seung Min. "Senate confirms Shaun Donovan to run OMB". Politico.com. Politico LLC. Retrieved 17 August 2014. ↑ "Executive Orders". Archives.gov. Retrieved 2013-04-22. ↑ "OMB Organization Chart" (PDF). Office of Management and Budget. Retrieved 17 September 2009. ↑ "Directors of The Office of Management and Budget and The Bureau of the Budget". Office of Management and Budget(Archived). Retrieved 18 October 2009.